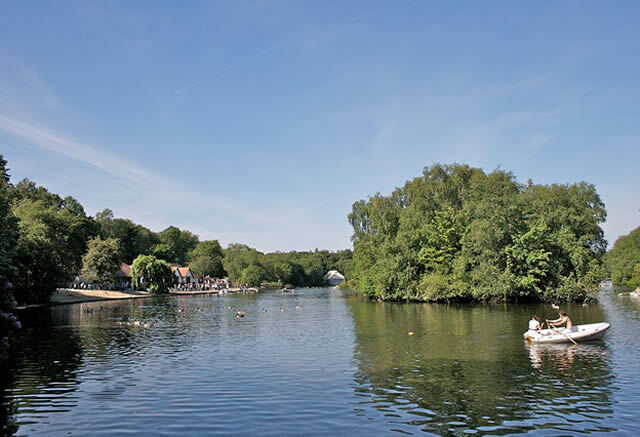 Heaton Park is the largest municipal park in Europe and contains a cornucopia of historic sites to visit. 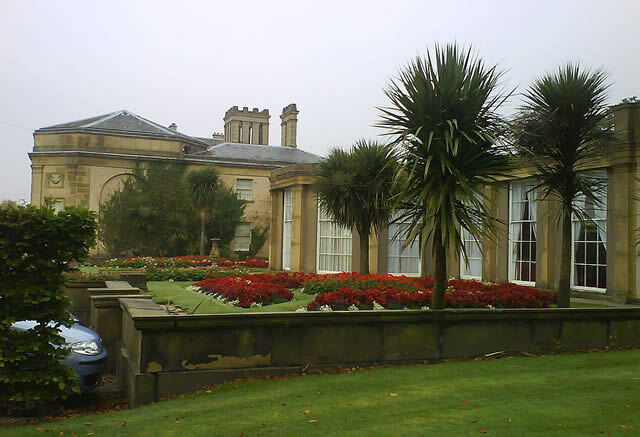 Heaton Hall had been owned by the Holland family since the Middle Ages. In 1684, when Sir John Egerton, 3rd Baronet of Wilton married Elizabeth Holland, the hall came to the Egerton family. In 1772, Sir Thomas Egerton, 7th Baronet (later the 1st Earl of Wilton) commissioned the fashionable architect James Wyatt, to design a new home for his young family. Although Wyatt had already established a reputation for himself as an innovative architect, he was only 26 years old and Heaton Hall was his first country house commission. Wyatt's neo-classical masterpiece was built in phases and was mostly completed by 1789. The park was originally laid out by William Emes in the style of Capability Brown. It has long been used for public events such as Heaton Park races which were established by the second Earl in 1827. The races were run on a course on the site of the present day boating lake until 1839 when they moved to Aintree near Liverpool, now the venue for the Grand National. During the 19th century when the railway to Bury was being laid, it stopped short of Heaton Park, as Lord Wilton was not prepared to see his estate disfigured by a railway. As a compromise the line was run under the estate in a tunnel and a railway station opened adjacent to the Whittaker Lane/Bury Old Road entrance in 1879 (now Heaton Park Metrolink station). The hall, "the finest house of its period in Lancashire", is built of sandstone and stuccoed brick, in a traditional Palladian design with the entrance on the north side and the facade on the south. The landscaping was designed to make the most of the uninterrupted views of the rolling hills across to the Pennines. An important feature of this was the ha-ha, used to keep the grazing animals, so important to the landscaping, away from the formal lawns, with a barrier that was all-but invisible from the house. There are 13 rooms occasionally open to the public in the central core and east wing. Manchester City Galleries restored the decorative detail in the 1980s and early 1990s. The ground floor rooms on the north east front have been converted to an expansive space that houses temporary exhibitions. The first floor rooms include the Cupola which was originally Lady Egerton's dressing-room. The room was styled in the 1770s "Pompeiian" style with mirrored walls and a domed ceiling — there are only three such rooms left in Britain. Designed by James Wyatt in 1800 for the First Earl, the ornamental temple is a simple, small rotunda of Tuscan columns with a domed roof and lantern. It has its own fireplace and is thought to have been used as an observatory by the Earl who is known to have owned a telescope bought from Dollond's of London. The cost of the telescope was £18.5s.0d (£18.25) – the same amount earned in a year by the Earl's under-butler. The Dower House was a plain brick building that was transformed with a decorative columned facade in 1803. In 2004 the house became the home of the Manchester and District Beekeepers Association and is furnished with an observation hive, equipment and displays with an apiary in the garden behind the house. Commissioned in 1807 by Sir Thomas Egerton, the Grand Lodge was designed by Lewis Wyatt as an impressive main entrance to the park from the south. The lodge is built of ashlar sandstone as a large triumphal arch and originally led onto one of the longest carriage drives to the house. It has two floors of accommodation, cellars under the west wing and an attic over the arch. The construction of the lodge completed the enclosure of the park by a 10-foot (3.0 m) high boundary wall. The Western Pleasure Grounds were probably laid out in the early 19th century as a peaceful retreat for the family. The gardens have recently been returned to their original design with pools, summerhouses and plants appropriate to the period. A tunnel leads from the flowergarden to the Dell and carries a causeway at high level across the gardens to allow the cattle, from the fields to the south of the garden, to be taken to the farm for milking without entering the gardens. The tunnel entrance is faced with large stones to give it the appearance of a natural cave. The orangery was added to the house by the 2nd Earl of Wilton around 1823. It was probably designed by Lewis Wyatt as it is similar to his orangeries at Tatton Park and Belton House. It was probably built for the wife of the 2nd Earl, Lady Mary Stanley who was a keen botanist. It was designed with a domed, glazed roof, fronted by a formal garden with two large copies of the Borghese Vase. The ornate glass roof was removed, to be replaced with a flat roof after Manchester City Council purchased the park in 1902. The 12-acre (4.9 ha) boating lake was constructed between 1908 and 1912 by previously unemployed men using only shovels and hand-pulled trucks. The lake, which is overlooked by the Lakeside Cafe, has three islands and is home to large numbers of ornamental birds and wildfowl including geese, ducks, swans and fantail doves. There are rowing boats for hire during the summer months. The lake is noted for its excellent carp fishing and is also stocked with roach, rudd, bream, tench and chub. The 18th century Walled Garden was the Earl of Wilton's kitchen garden supplying fruit and vegetables for the estate. The walls provide a warm microclimate for crop cultivation and support for climbing plants. The Horticultural Centre staff now grow plants for the city's displays and for sale to the public. There are also demonstration gardens open to the public during the summer and a sensory garden. Shortly after the Heaton Park was bought by Manchester Corporation the tramway was extended into the park and the first tram arrived on 31 May 1903, bringing visitors from Manchester. By 1934 buses were taking over from trams and the tramway was disconnected from the main system and covered in tarmac for use by buses. The initial idea, to construct a new tramway from Grand Lodge to Heaton Hall, was considered too expensive, as it would require remedial works to carry it across the railway tunnel. Therefore, a new scheme was proposed to open up the old Manchester Corporation Tramways spur from Middleton Road to the old tram shelter some 300 yards (270 m) inside the park. The work was completed in 1979 and the Heaton Park Tramway was officially opened on 28 March 1980. There is an Animal Centre set in the old stables, you can see a variety of animals including: alpacas, chickens, cows, goats, guinea pigs, peacocks and sheep. You can also see highland cattle and horses around the park. Please do not feed the animals. The tramway currently has an operating fleet of 3 electric trams and one horse tram. The park and activities are wheelchair accessible. A companion would be a good idea for the visually impaired. Location : Heaton Park, Middleton Road, Higher Blackley M25 2SW. Transport: Heaton Park (Metrolink). Bus routes 59, 149, 156, 164, X35, 90, 135 and 484 stop nearby.